The Redwoods Golf Course in Langley, BC is an 18 hole Ted Locke designed championship course. The facility opened on June 29, 1994, and in 2003 the clubhouse underwent a complete renovation and expansion, re-opening in March 2004. Paired with the golf course the property also houses a covered, heated driving range facility which is open year round. Also available are two manicured putting and chipping green areas along with a practice bunker. The clubhouse includes our golf shop complete with golf apparel and accessories and our restaurant open to the public, boasting a fantastic view of the Coastal Mountains and golf course. Additionally, our restaurant offers a large open air patio which is the perfect spot to watch your friends and others finish their round of golf on the 18th green. 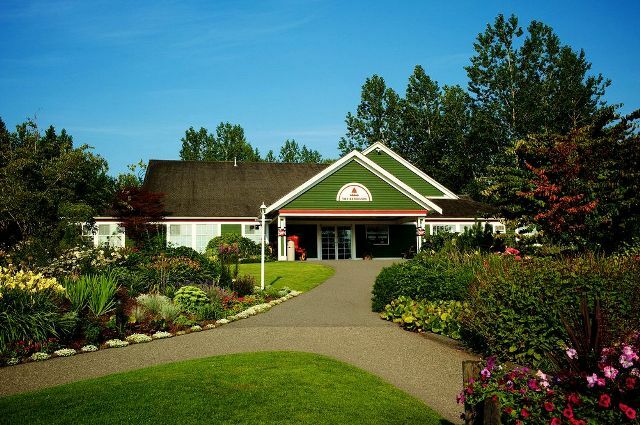 The Redwoods is a perfect location for weddings, tournaments, corporate gatherings, meetings and Christmas parties. Smaller events may be accommodated in our mill room or boardroom areas. We can also accomodate larger groups in our restaurant and outdoor reception tent. Please contact our Special Event Coordinator, Jill Jonkman, for group booking inquiries. 604-882-5130 ext. 290.